True virtuosos name their businesses after themselves. Gary Danko’s, Ike’s Place, Philz Coffee, Mitchell’s Ice Cream… Mister Archer. 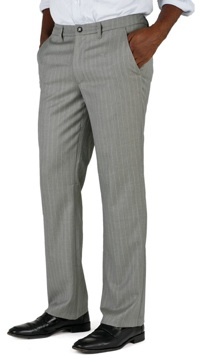 After all, when your name is on the door, you tend to work a little harder. 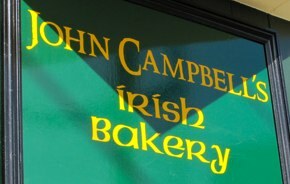 John Campbell’s Irish Bakery just set up their second shop in San Francisco. Their freshly baked goods blossoming from cloth-lined baskets evoke the warm memories of grandma’s freshly baked pie cooling on the windowsill. 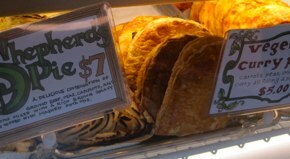 John holds the Order of the Master Baker and a Guilds Bakery Certificate… but the proof is in the pudding, or, in this case, the proof is in the pasties—ground beef mixed with peas, onions, carrots, and gravy freshly baked into a hand pie. His loyal clientele regularly fill their pantries with his treats including potato bread, Irish crusty bread, brown bread, his peerless soda bread, and, of course, the legendary Belfast Bap—a traditional Northern Ireland round bread. Long night? Start off the day with the Breakfast in Bread—Irish sausage, black and white pudding, eggs and cheese baked to perfection in a homemade bread. Delight your colleagues with apple puffs and blueberry, chocolate and raisin scones. These delicacies are the real pot o’ gold at the end of the rainbow. On this St. Patrick’s Day, we should hope not just for the luck of the Irish, but also the baked goods.